Santa Rosa City Hall is located at 100 Santa Rosa Avenue, Santa Rosa, CA 95404; phone: 707-543-3010. 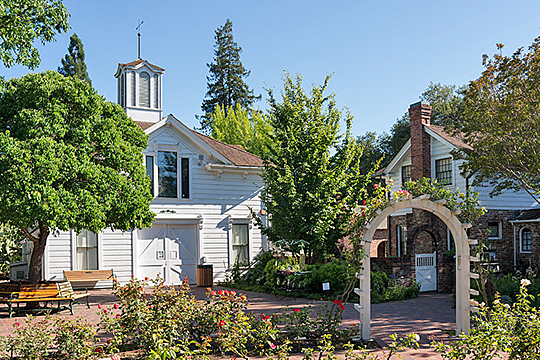 Photo: Luther Burbank Home and Gardens, ca. 1889, 200 Santa Rosa Avenue, Santa Rosa, California. Listed on the National Register of Historic Places in 1966. A National Historic Landmark. Photographed by User:Frank Schulenburg (own work), 2012, [cc-by-3.0 (creativecommons.org/licenses/by/3.0)], via Wikimedia Commons, accessed February, 2013. Santa Rosa is the county seat of Sonoma County. It is said to owe its name to Padre Juan Amarosa of Mission San Rafael, who baptized an Indian girl of the region in 1829, calling her Rosa because it was the feast day of St. Rose of Lima. The rich soil and gentle climate of the Santa Rosa Valley so delighted Luther Burbank [1849-1926] that he chose this as the best place for his experiments in plant breeding. For half a century he worked here, experimenting with thousands of kinds of plants, developing a long series of what he called "new creations." Uninterested in proving special scientific theories, Burbank aimed solely to produce more and better varieties of cultivated plants. Among his achievements were the Burbank potato; thornless cactus; edible cactus; the Santa Rosa, climax, Wickson, apple, gold, and other plums; a new fruit, the plumcot; the giant, sugar, and stoneless prunes; the Burbank cherry; the Burbank, Santa Rosa, and peachblow roses; Shasta daisies; giant and fragrant callas; and many other new flowers, fruits, vegetables, ferns, grasses, trees, and nuts. He lies buried under a tall deodar, a few steps from his charming greenhouse.